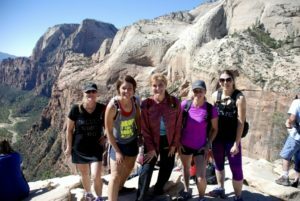 It’s peak camping season in Zion, and if you’re new to the outdoors or have never been to Zion before you may be wondering what to wear camping. Packing for camping can be tricky due to the difference in daytime and nighttime temperatures, possible elevation changes, and the types of activities you have planned during your camping trip. Lets start at the top. Hats are a no-brainer in winter but they also make sense in summer when you want to shield your eyes and face from the sun. Baseball caps are good for that but for extra protection for your ears, neck and shoulders, consider adding a bandana or wearing a broad-rimmed hat. Light colors and moisture-wicking fabrics are the way to go in the summer sun, especially if you’ll be hiking. Light colors will also help reflect some of the UV rays. If you’re particularly sensitive to sun, a very lightweight long-sleeve shirt can provide extra protection. Check the forecast. You’ll likely want to bring a mix of hiking shorts and pants. Remember that Zion Crest Campground is above 6,000 feet and nights can be a tad chilly, while days hiking down in the canyon can scorch. Loose-fitting pants allow airflow, and jeans are nice for activities like horseback riding. Cargo pants are also a great option, especially convertible pants that zip down into shorts. Like many people, your comfort level during camping, and especially if you plan to hike, is directly related to your footwear. 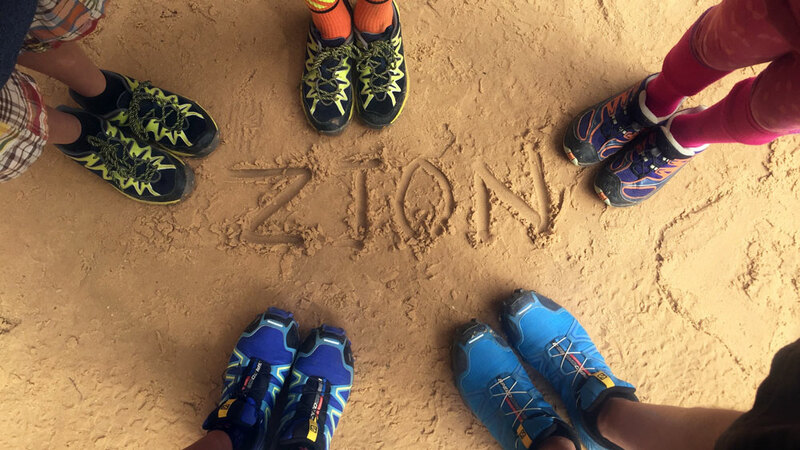 Since camping in Zion means spending time in the great outdoors, athletic footwear is your best bet. This usually means your favorite hiking shoes or sneakers, plus sport sandals. Bring water shoes if you’re planning to hike The Narrows, and don’t forget flip flips for the shower. 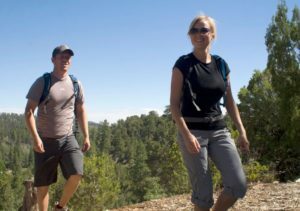 • Hiking boots or sneakers: A no-brainer if you’re planning to hike any trails or even do some solid walking. A dependable, comfortable pair should always top your list. • Active sandals: Thick soled with an ankle strap gives you the best support for stepping on uneven terrain around camp. • Water shoes: Closed-toe is your safest bet, especially if you’re planning on doing any wet hiking or canyoneering. • Flip flops: For the shower. Pro tip: Consider your outfit when you arrive at Zion Crest Campground. That’s what you’ll be wearing to set up your tent and set up your campsite. For that reason, you’ll want something comfortable and durable. Layers are a great idea. If you get hot while setting up your tent, you can peel down a layer (don’t forget to wear sunscreen). If you get cold, you can throw an extra layer on. Zion is an amazing destination for a friends or family camping trip. Pack right and have fun!